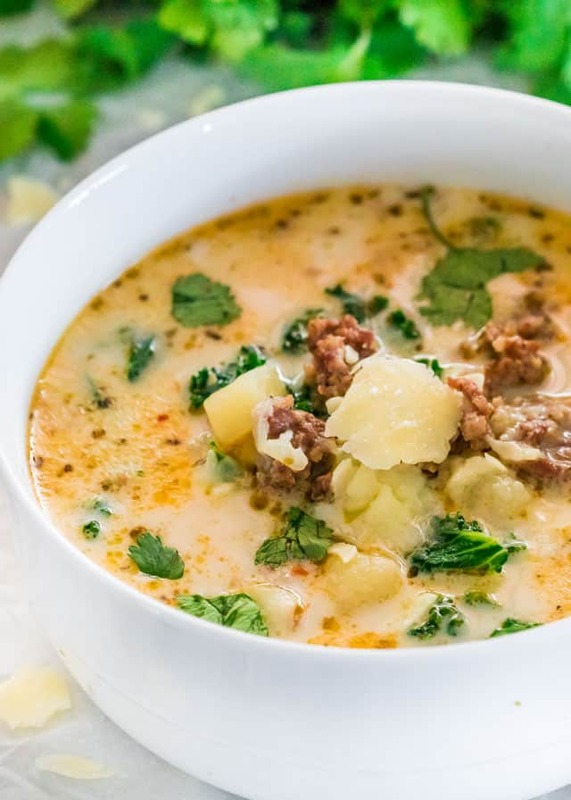 This Instant Pot Zuppa Toscana is a copycat recipe of the popular Olive Garden Zuppa Toscana. It’s loaded with sausage and potatoes but best of all it’s homemade and even more delicious! The Olive Garden used to be one of my favorite restaurants and we used to love going there for lunch to have the soup and salad. 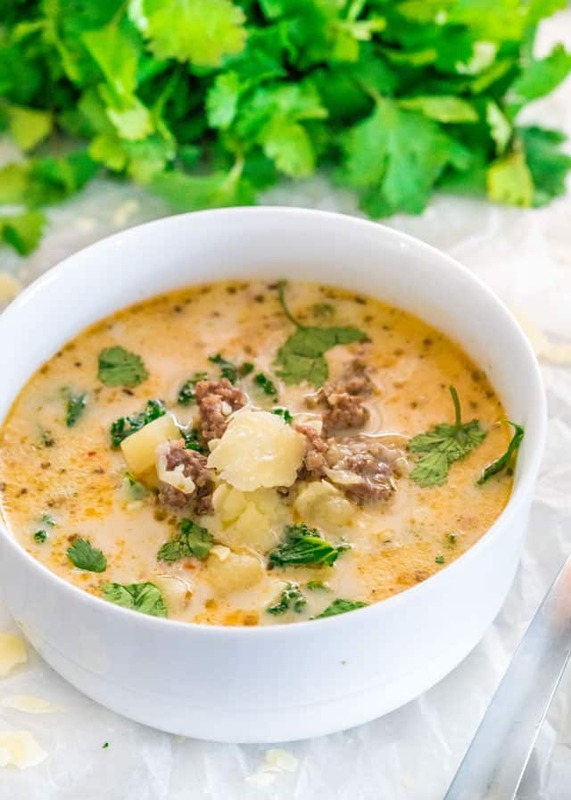 One of my favorite soups there is the Zuppa Toscana. 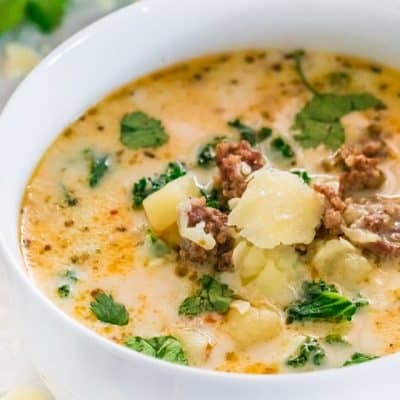 Zuppa Toscana means Tuscany Soup and a classic zuppa Toscana is normally a soup made from kale, potatoes, sometimes cannellini beans, onion and carrots. The main difference with the Olive Garden is the Italian sausage. I chose a milder Italian sausage for this soup but I did add some red pepper flakes. You can definitely make it spicier by using a spicy Italian sausage, and adjust the red pepper flakes to your liking. Even though heavy cream is usually added to this soup, I used half and half which has a lower fat percentage than heavy cream. If you don’t like kale, you can also use spinach. This soup is delicious and comforting, all in one pot, easy to prepare totally satisfying. Every single spoonful is loaded with chunks of Italian sausage and potatoes, so incredible. I promised you a lot more instant pot recipes, and trust me I have more to come. I love the Instant Pot and it really is my most used kitchen appliance now. It just makes things so much easier and quicker. 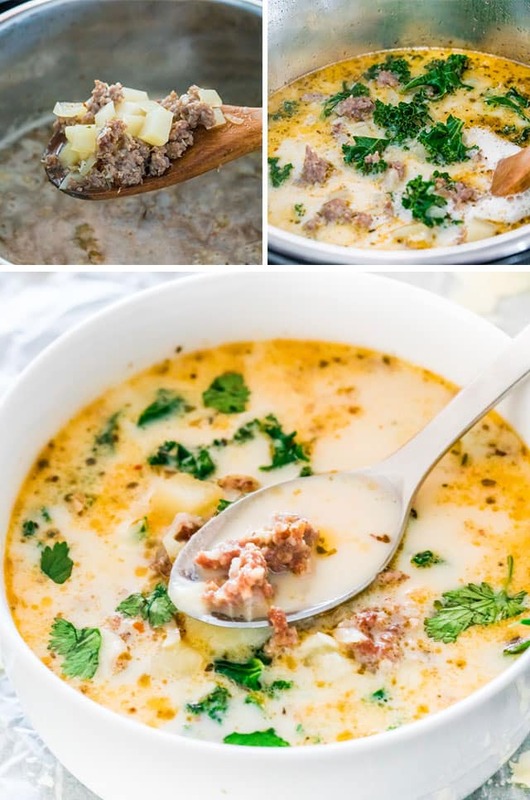 This Instant Pot Zuppa Toscana is a copycat recipe of the popular Olive Garden Zuppa Toscana. It's loaded with sausage and potatoes but best of all it's homemade and even more delicious! Heat the olive oil in the Instant Pot, then add the sausage and brown for 3 minutes until it's no longer pink, breaking up with a wooden spoon. Stir in the onion and garlic and cook for another 3 minutes until the onion softens and becomes translucent. Stir in the red pepper flakes, Italian seasoning, salt and pepper. Add the cubed potatoes and the chicken broth. Give it a stir. Close the lid (follow the manufacturer's guide for instructions on how to close the instant pot lid). Set the Instant Pot to the Manual setting and set the timer to 5 minutes. At this point you can adjust the salt and pepper if necessary. Add the chopped kale and set the Instant Pot to the saute setting again. Cook for two more minutes uncovered, until the kale cooks a bit. Stir in the half and half or heavy cream. Turn off the Instant Pot, by pressing the cancel button. Serve the soup warm garnished with Parmesan cheese or bacon bits if preferred. What is an Instant Pot: An Instant Pot is a multi-cooker, it's like seven different appliances all in one! It does the job of a slow cooker, pressure cooker, rice cooker, steamer, yogurt maker, etc. Note: The Instant Pot will default to 30 minutes when set on manual, use the down arrow to change to 5 minutes. Nutrition: Nutritional information assumes about 2 cups per serving. Please keep in mind that nutritional information is a rough estimate and can vary greatly based on products used. This soup was amazing. I did omit the bacon and cauliflower and was delish. Substituted oregano and basil for Italian seasoning. Was a hit with my husband and 2 young ones. Will definitely make again. Love this recipe. I must confess I made two additions. 1) added between 5 or 6 really large potatoes and 2) I put in 3/4 of a quart of half and half. Found this to make the soup very creamy and thicker. We like spinach better than the kale , but both are good. I’m glad you enjoyed it, and love your additions! Hey I love cheese too! Glad you enjoyed it!